I graduated from college in 2001. The day of my graduation was sunny (but not too hot) and my parents, brother, aunts, uncles, and cousins all came to watch the momentous event that was to launch me into official adulthood. After walking across the stage and taking the obligatory photos in front of all the “memorable” campus buildings, we drove down to my new home. On the way, we stopped for dinner at the Macaroni Grill. I’ve always been a fan of Macaroni Grill. It isn’t unheard of for me to stop by the restaurant to buy just their bread. When I was on the West coast, I ate more of their steak salads than I can count. The pasta was fresh and the sauces delicious. Unfortunately now, it’s not always convenient to make it to the local Macaroni Grill – it’s almost always packed and parking can be a pain. Fortunately, Macaroni Grill has just launched a new line of Macaroni Grill inspired frozen entrées that allows me to have the taste of Macaroni Grill without having to wrestle for a parking space. There are four varieties of Macaroni Grill frozen entrees that have just arrived in stores: Basil Parmesan Chicken, Grilled Chicken Florentine, Roasted Garlic Shrimp Scampi, and Spicy Italian Sausage Pomodoro. Each meal promises to quickly give you authentic tasting Italian meals without having to leave the house. 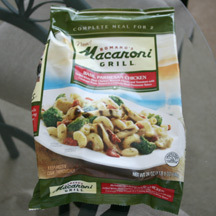 For me, having the Macaroni Grill name on these frozen meals sets a high standard for taste and flavor. If it doesn’t taste at least as good as what I would get in the restaurant, I would be disappointed. 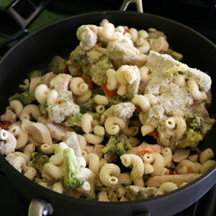 I tested out the Romano’s Macaroni Grill Basil Parmesan Chicken which is described as “Grilled White Meat Chicken, Broccoli Florets and Tomatoes with Cavatappi Pasta Tossed in a Creamy Basil Parmesan Sauce.” The first test comes when you pour the contents out into the skillet. Do I see all of the ingredients listed in my skillet? 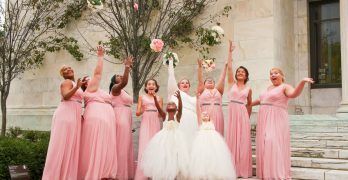 Check, check, check, and check. I was happy to see that there were nice sized pieces of chicken as well as a fair amount of broccoli. I think my packaged thawed and refroze slightly, which is why you see a large clump of ingredients on the top right of the skillet. That block was easy enough to break apart during the cooking process. Just as a frozen entree should be, the Macaroni Grill meals are easy to prepare – as in throw it into a pot, add some liquid, and cook. In this case, to cook the Macaroni Grill Basil Parmesan Chicken on the stove-top, I added 1/4 cup pf milk into my skillet after I dumped out the contents. Then I simply covered the meal with a lid and let it cook for about 15 minutes (directions say it can be from 13 to 16 minutes.) If you don’t feel like getting a skillet dirty, it is also microwaveable and cooks in 12 to 18 minutes. The Macaroni Grill Basil Parmesan Chicken tasted as good as it looks. The sauce was incredibly flavorful, yet wasn’t overwhelming. I loved that each ingredient in the dish cooked up perfectly. The pasta was soft (but not mushy.) The broccoli wasn’t super crisp as a I prefer, but there was a nice firmness to them. And the chicken was tender and moist. If It hadn’t come out of my own skillet, I wouldn’t have known that it didn’t come out of a restaurant. Each of the Macaroni Grill frozen entrées is supposed to have 2 servings per package, but I kept the entire dish for myself. Greedy? Maybe a little, but I was hungry and it tasted good. There are 480 calories per serving which isn’t too bad. 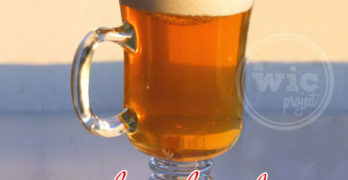 However it seems a little high on fat (33% DRV, ) sodium (44%,) and cholesterol (34%.) Basically that tells me that this isn’t a meal I want to eat every day, but it can be a great treat to serve maybe once a week. Perhaps a quick delicious Friday dinner – all the flavor of going out to eat without having to spend the big bucks or get in the car. For more information about Romano’s Macaroni Grill Frozen Entrées, you can visit their website. Their website also has a coupon for $1.50 off any frozen entree. To stay up-to-date on the latest news and promotions from Macaroni Grill, you can also Like Macaroni Grill on Facebook and Follow Macaroni Grill on Twitter. One winner will receive a Macaroni Grill Prize Pack, which includes a Macaroni Grill sample, serving bowl, and pasta tongs. In the comments below, let me know which flavor of Romano’s Macaroni Grill Frozen Entrées you’d like to try the most. If you don’t see one you like, then let me know what Italian meal you would like to see added to their product line. Giveaway ends at 11:59 PM EST, September 6, 2010. Disclaimer: This post consists of my (and/or fellow tester) opinions only. No compensation was given for this review/giveaway. 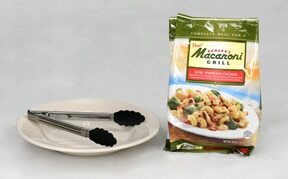 I did receive a free Romano’s Macaroni Grill gift pack and information from Romano’s Macaroni Grill through MyBlogSpark to use and test for the purposes of this review. This did not affect the outcome of this review. The Roasted Garlic Shrimp Scampi. Roasted Garlic Shrimp Scampi is the flavor I’d like to try. I’d like to try the Basil Parmesan Chicken the most, I’ve already tried the Italian Sausage dish, and it was scrumptious, but this would be really good! I’d love to try the Grilled Chicken Florentine. I would choose the Basil Parmesan Chicken . I’d love to try the Basil Parmesan Chicken. Yum! Grilled Chicken Florentine, and now I’m hungry! I want to try the grilled chicken florentine. I’m looking forward to trying the Roasted Garlic Shrimp Scampi the most. Garlic Scampi!! Looks really good. I am an existing email subsriber. I think a penne with lobster vodka sauce would be soo good for them to make. I’d like to try the Spicy Italian Sausage Pomodoro. I’d love to try the Spicy Italian Sausage Pomodoro. I think we would like the Spicy Italian Sausage Pomodoro. I would like to try the Grilled Chicken Florentine. I would love to try the Roasted Garlic Shrimp Scampi. The Basil Parmesan Chicken is my favorite. I love Macaroni Grill restaurants, I’ll try anything they put into the grocery store, especially the Basil Parmesean Chicken. Thanks! I’d like to try the Basil Parmesan Chicken. Definitel Roasted Garlic Shrimp Scampi! The Roasted Garlic Shrimp Scampi sounds really yummy! I’d like to try the Grilled Chicken Florentine! Thanks! I love the Grilled Chicken Florentine. 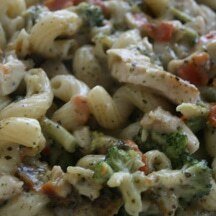 Macaroni Grill Basil Parmesan Chicken sounds delish! I’d like to try the Grilled Chicken Florentine. Thank you for the chance to win. I am a big fan of Macaroni Grill and would like to try the frozen Spicy Italian Sausage Pomodoro. The Basil Parmesan Chicken would be my choice! Roasted garlic shrimp scampi looks good. I’d like to try the Roasted Garlic Shrimp Scampi. I would like to try Basil Parmesan Chicken. I want to try the Basil Parmesan Chicken. I’d say garlic shrimp scampi. I’d like to try the Roasted Garlic Shrimp Scampi, thanks. I want to try Spicy Italian Sausage Pomodoro. 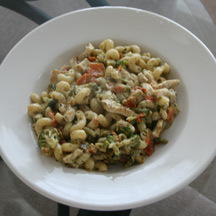 Thanks for the giveaway…would love to try the “Basil Parmesan Chicken”. I would love to try the Spicy Italian Sausage Pomodoro. I love the Chicken Alfredo (Kit) in the box… I have cooked them twice now and once I used chicken and the second time I used shrimp… I added some peas for color… U you can use spinach- brocolli.. but it was very good.. The only ingredients I had to supply was the butter, milk, and meat.. My family loves it…. That’s a great idea to add some additional veggies for color and flavor.